Myth: If you’re addicted to drugs you are a lost cause. Fact: If people battling an addiction get the right help, it’s very possible for them to make a full recovery. Jack Nagle used to be addicted to drugs. He tells SBS how he first started using alcohol, marijuana and prescription pills before he moved on to crystal methamphetamine— a highly addictive stimulant drug. Nagle says he moved on from being a recreational ice user to using ice full-time because he could “buy a lot less for a better effect” than other drugs like speed. But his tolerance for it soon built up and with time, he needed more and more. Within a few months of full-time use, he says, his ice addiction took over. Nagle adds that he entered a frustrating cycle of addiction—knowing he needed help but continuing to binge on drugs. Nagle was addicted to ice for over a year. He reached out to his family for help after a “massive binge on ice” where he spent $7,000 on drugs in a matter of days. Many people believe that poverty doesn’t exist in Australia. The experts tell SBS otherwise and bust this myth with hard facts and real life experience. He soon spent a month in rehabilitation. Nagle explains this was a crucial turning point in his journey to full health because it enabled him to receive support from professional drug and alcohol staff, who had previously lived with an addiction. “One guy told me his story and described the way he thought and felt when he was living with a drug addiction. He was able to share that really intimately with me and I’d never been able to talk to someone on that level. Want to help people in need? Mission Australia's James Toomey explains why donations and volunteers are essential to delivering services to disadvantaged people in Australia. Nagle’s story of recovery is unique but not unimaginable. People who are addicted to drugs can recover and shake their addiction, with hard work, dedication and social support. “You almost need people to come at you with some love and support and then that helps—or it did for me—to break through my shame and allowed me then to ask for some help,“ Nagle, the founder of Real Drug Talk adds. While Australia is a country rich in natural resources and social opportunities, our nation’s wealth is not spread equally among all of its residents. Although support is what someone with an addiction needs to fully recover, research suggests that only one in four Australians living with a drug or alcohol addiction will be able to reach out for help. In 2015-2016, an estimated 134,000 (or one in 180) Australians sought treatment for drug and alcohol use, according to the Australian Institute of Health and Welfare. Professor Maree Teeson, the director of the National Drug and Alcohol Research Centre says many Australians stereotype people using drugs as being a lost cause. “A lot of people of people strongly believe that if you’re an addict, or if you’re addicted to drugs or alcohol, that’s it, that your life is over,” she says. 36-year-old Jarrod was just like any other professional before he became addicted to ice. He had a well-paying job, a great life partying on weekends with mates, a loving wife and a child. So what went wrong? Teeson advises Australians wanting to help someone with an addiction to recognise that the person is separate from the addiction and the behaviour. “The first thing is that they’re people who are actually having trouble, perhaps, with drugs and alcohol. “People are incredibly resilient,” says Teeson. If you need support, you can contact Lifeline on 13 11 14, the National Alcohol and Other Drug Hotline on 1800 250 015 or visit Real Drug Talk. If you, or someone you know is in need of free, evidence-based help to manage their mood, alcohol, or drug use, please visit The Shade Project. For more information about ice, access the online toolkit providing information and resources about crystal methamphetamine (including where and when to get help): Cracks in the Ice. All six episodes of Struggle Street series two are available to view on SBS On Demand. 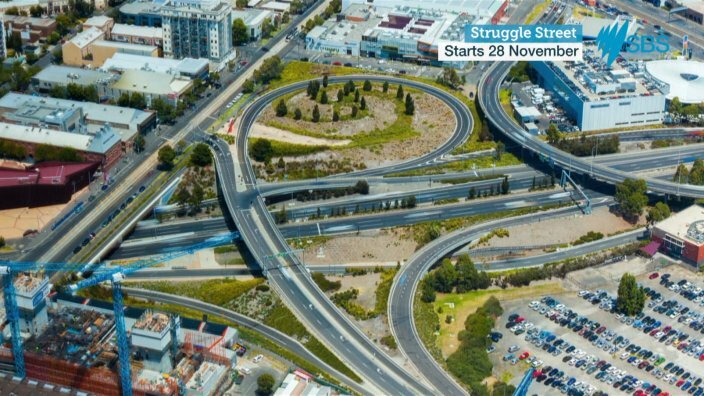 Struggle Street series two is produced by KEO Films with funding support from Screen Australia and Film Victoria. How much do you know about the science of poverty? Evidence suggests that our mental health is significantly shaped by the social, economic and physical environment in which we live. Poverty really can happen to anyone at any time, even people who grew up to be global celebrities. What would it take to abolish poverty in Australia? In Australia, the poverty rate has remained stagnant for a decade. Tackling this means addressing a culture that “others” those who are struggling while disguising its own systemic flaws, writes Neha Kale.